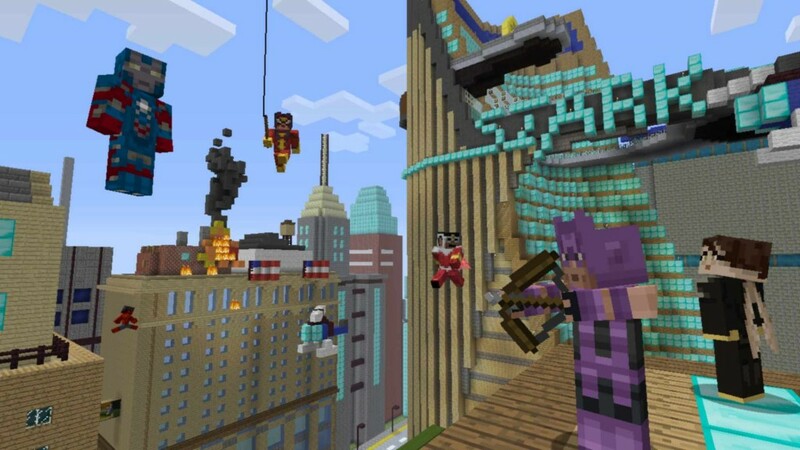 Minecraft Xbox 360 Edition will be receiving some Marvel Comics-themed content in the near future. 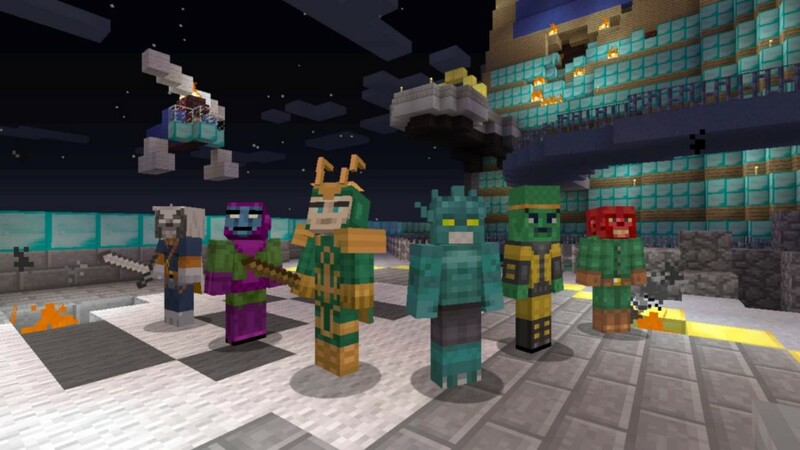 The Avengers Skin Pack will provide several character skins based on famous heroes and villains from Marvel lore. The Skin Pack contains 35 characters in total. The characters announced on PlayXBLA today include Captain America, Iron Man, Hulk, Thor, Nick Fury, Black Widow, Hawkeye, Loki, Wasp, Falcon, Vision, Maria Hill, and Agent Coulson. One of the screenshots seems to show the Iron Patriot and War Machine armors. I think Spider-Man's hanging out in the background of the cityscape shot, too. The Avengers Pack joins a growing list of premium content for MineCraft Xbox 360 Edition. Previous add-ons include other skin packs like Battles & Beasts as well as texture packs like Plastic and Natural that change the look of the game world. More recently, the developers have begun releasing "mash-ups" that include both skins and new building blocks based on other games. The first two mash-up packs centered around Mass Effect and Elder Scrolls V: Skyrim. Xbox 360 owners will be able to buy the new Avengers content for $2.99. That makes it a dollar more expensive than most skin packs offered for the game. Guess that's a downside to basing your DLC on a high-profile franchise. At least it's cheaper than the mash-ups. Minecraft made its PS3 debut earlier this week. 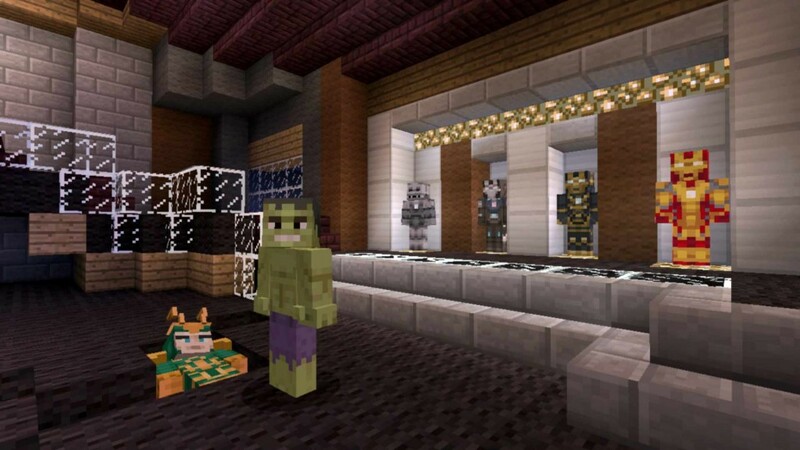 Mojang has said that the PS3 version will receive premium skin and texture packs as well. I wouldn't be surprised if this Avengers DLC spreads to that console eventually. After all, updates for the Xbox 360 and PS3 versions will be developed in tandem from this point forward. The eventual PS Vita, PS4 and Xbox One versions will probably receive this DLC in time as well but there's been no confirmation either way yet. The Avenger Skins Pack announcement follows on the heels of Minecraft Xbox 360 Edition's new sales milestone. The 360 version has sold over 10 million copies through Xbox Live and retailers since launching in May 2012.